Non-disclosure and misrepresentation cause more liability for the licensee than any other factor. Failure to disclose and misrepresentation claims make up more real estate disputes than all other complaints combined. Many lawsuits are brought by buyers against brokers and sellers alleging that they failed to disclose pertinent facts about the property lawsuits, even if unfounded, drain resources from the business of selling realer state and thus can be problematic for a brokerage firm. The benefit to the consumer when a licensee has successfully completed this course is that the agent will be able to explain the disclosure obligations of the seller and discuss the purpose of, importance and types of information contained in most seller disclosure statements as well as summarize the environmental issues that require disclosure and explain potential problems. Material Facts Relate the disclosure obligations a licensee owes to sellers and buyers. Ancillary Disclosures Be prepared to discuss the wide variety that may be necessary prior to and during transactions. The document is often used as supporting evidence in court when a buyer decides to sue a seller for non-disclosure. That’s why it’s very important that sellers fill it out correctly and disclose pertinent information, which may affect the buyer’s decision to move forward with the purchase. 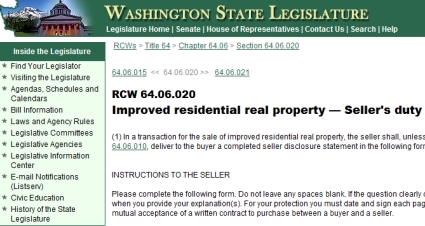 First and foremost, realize that this form must be completed in the seller’s own handwriting. An agent cannot and will not complete this form for a seller under any circumstances. This is the date that sellers complete the disclosure. If something changes between the date the TDS is completed and the property sells, prudent sellers will update the transfer disclosure statement. Sellers may want to make the buyer’s future home inspection part of this disclosure by checking the appropriate box, in addition to including pest reports or any other types of inspections. Sellers should indicate whether they are presently living in the property. The main thing you need to know about the transfer disclosure statement is that sellers are not warranting the condition of the home; sellers are simply disclosing its condition. Sellers should check only the items that pertain to the home. When a section asks whether the home has a range, dishwasher, smoke detectors, rain gutters, pool, among other items, and whether water is supplied by the city, well, private utility or other, be careful that each box that applies is checked and marked correctly. By law, real estate agents cannot fill out any sellers’ home disclosures unless the agent is the seller or a party to the transaction. However, that doesn’t stop some naive agents from completing disclosures on behalf of their clients and opening themselves up for potential lawsuits. After all, it’s mostly lawsuits that have prompted the creation of many of the disclosure forms agents ask sellers to complete. Material facts are commonly referred to as anything that would affect the buyer’s decision to purchase or the price and terms the buyer offers. In other words, if you have knowledge about a defect, it should be disclosed. Many home buyers are fine with news of a death occurring in the house as long as it wasn’t violent or gruesome. There are also buyers who believe homes are haunted by former occupants who died in the house. If you have specific details, you might want to consider sharing it with the buyer unless it pertains to AIDS. Check with your local laws and a real estate lawyer for advice about deaths surrounding AIDS because in some states, AIDS falls into a protected class and could be subject to discrimination claims as well. In California, sellers are to notify buyers if a death has occurred on the property within the last three years. When city people purchase property in rural areas, they may not realize that the agriculture or forestry businesses may involve dust, chemicals, spraying, etc. The buyer(s) acknowledge that the property they are purchasing may be affected by that activity. Does every home repair need disclosure? In areas with basements, this is a huge issue, as are problems surrounding wet basements. But so are defective slabs. Generally speaking, unless you will violate a state or local law by disclosing, if you have knowledge of a defect or material fact, then disclose it. If a neighbor repeated a rumor, and you have not verified nor disproved the rumor, you might want to consider telling the buyer about the rumor. Follow the Golden Rule: If you would like to know, your buyer probably does as well. Typically, buyers aren’t upset by receipt of negative information. They get upset and call a lawyer when they feel they have been duped, deceived, or lied to.